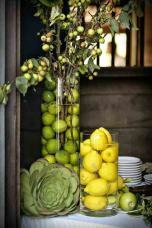 These garden party decorations follow on from my Secret Garden party theme page. 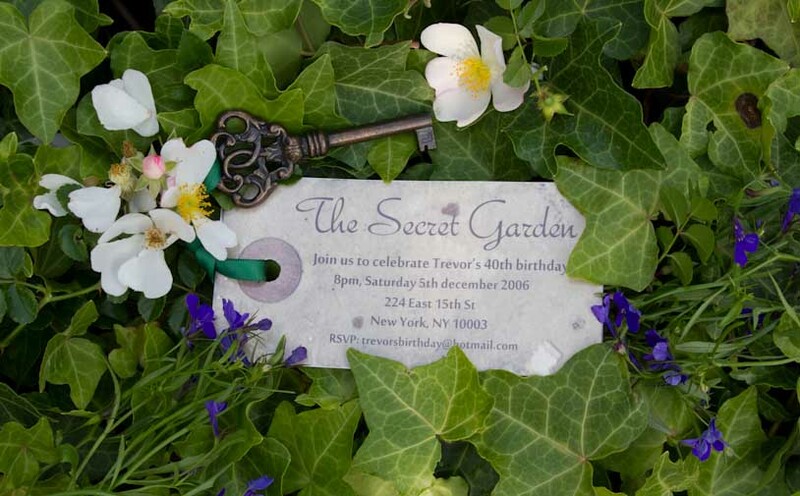 The Secret Garden is a wonderfully evocative party theme that I recomend using to transform a regular garden party into something a bit more special. 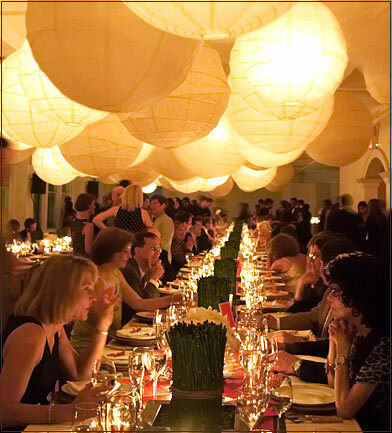 Although these garden party decorations can be read on their own, you may prefer to read The Secret Garden party page first—which explains the theme in more detail and features ideas for invitations (below left), and food & drink (below right), along with food styling and presentation tips. 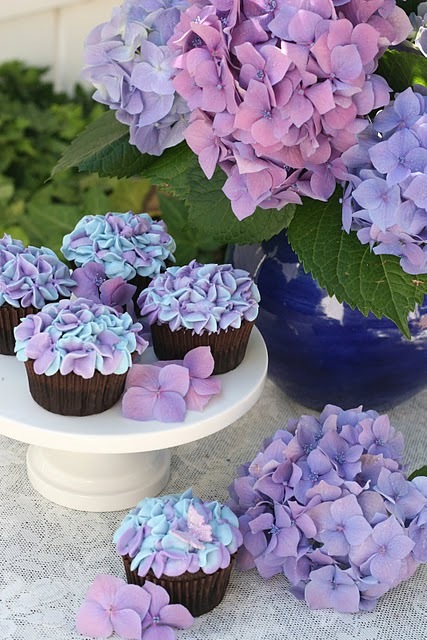 You can then follow the link at the bottom of that page to return here and continue my suggestions for garden party decorations in the order they are intended. Lighting has a huge impact on the ambience of a party so think about using only candle light for your garden party decorations. 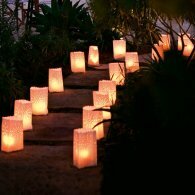 Line the route to the garden with paper luminaries, which give a lovely warm amber glow (see photos below for inspiration). Just fill brown bags with sand to weigh them down then pop a jam jar inside with a candle in it. 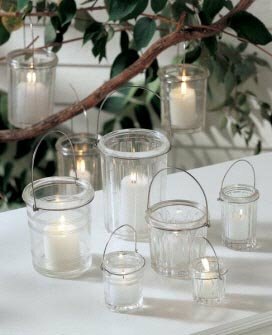 Alternatively, you can use battery operated LED candles which are really cheap and have a flickering effect to look natural. 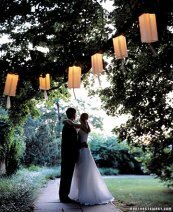 Suspend hanging jar lanterns (below left) en-masse at different heights from tree branches or trellis. 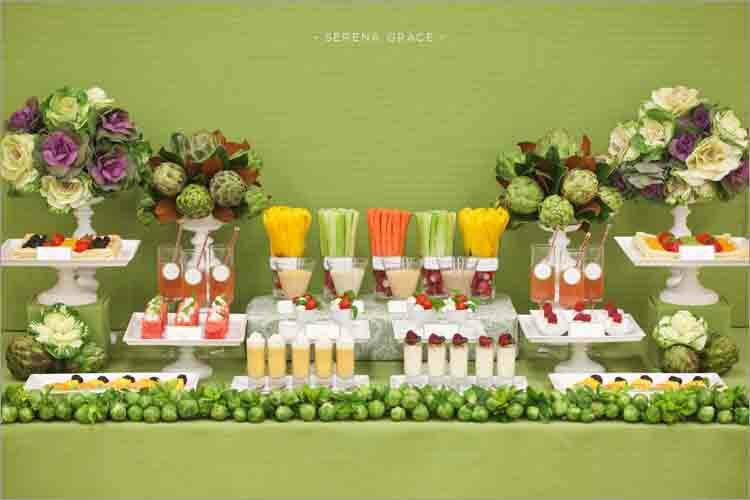 This photo (below right, from Martha Stewart Weddings) shows how effective these simple garden party decorations can be. 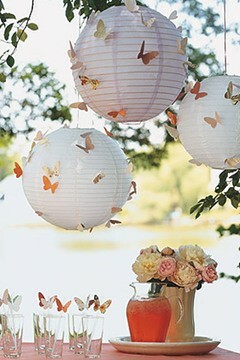 If you're using plain paper lanterns, a great way to embellish these further is to add these cute paper butterflies using the free template here (below, by Martha Stewart). 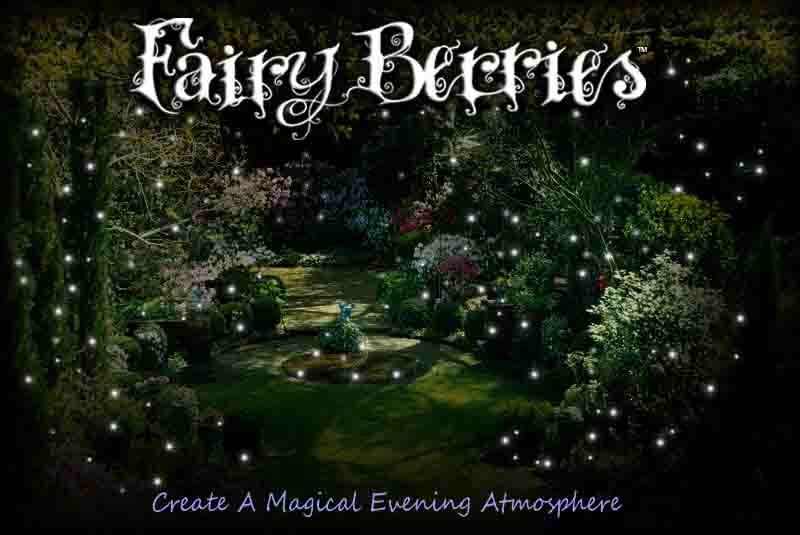 Another way to give your garden party decorations a magical feel is to light your event with these Fairy Berries. 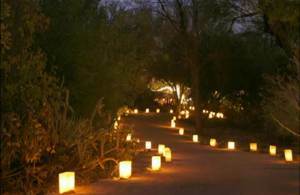 These 3/4" diameter balls contain small white LED lights that slowely fade on and off. Scatter them over your lawn or hang from trees and bushes using the recessed hooks. Collectively the lights create a magical moving firefly effect (see video below for demonstation). 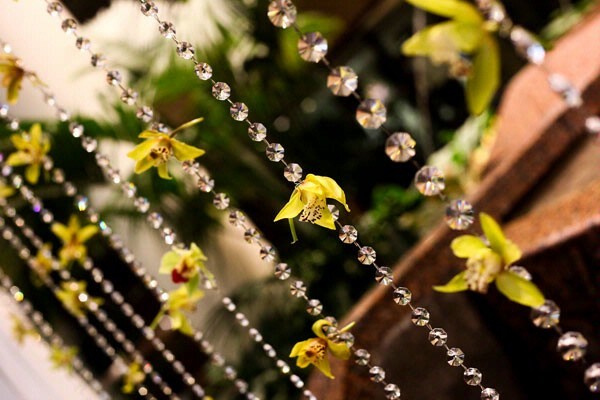 Crystal beaded strands can add a really magical touch to your Secret Garden party theme. 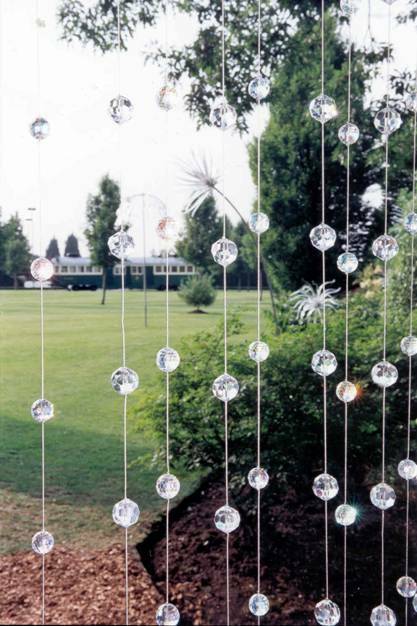 When I produced Elton John's very first White Tie and Tiara Ball I worked with Swarovski to dress one of his gardens, turning it into a enchanted forest, using strands of their 'Crystal Rain' hanging from trees. 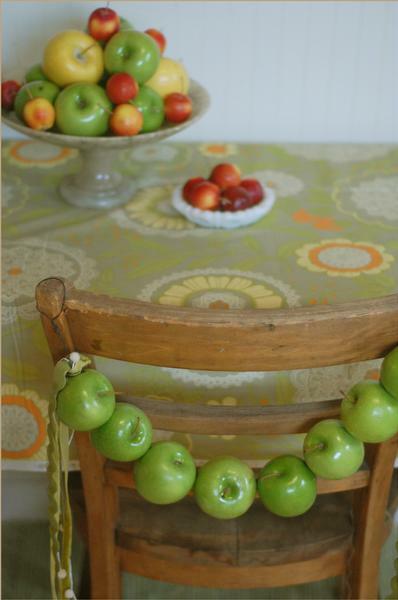 You can do something similar by hanging strands of crystal beads from trees in clusters at varying heights. Be sure to angle some lighting towards them (or position some jar lanterns among them) so they'll twinkle when they catch the light. 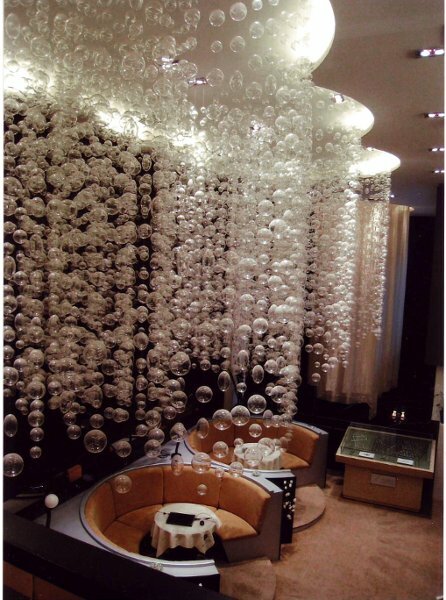 A variation of the crystal bead strands are these larger 'bubble curtains' (USA only) which make impressive looking clusters when hung from tree branches or over the table as a chandelier (below right). 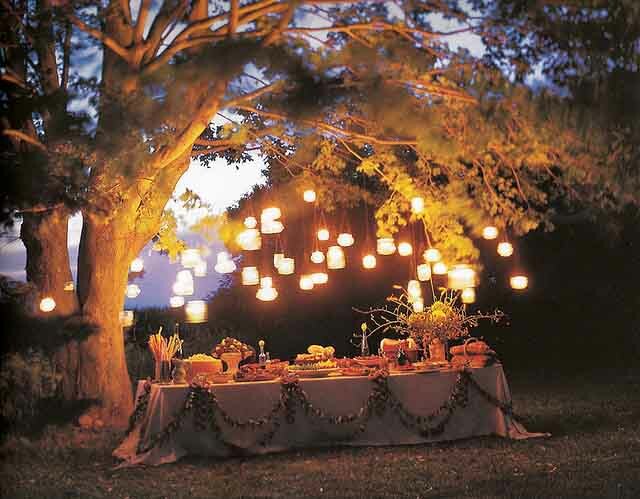 For a Secret Garden theme I think it's important to make the garden party decorations seem less everyday. 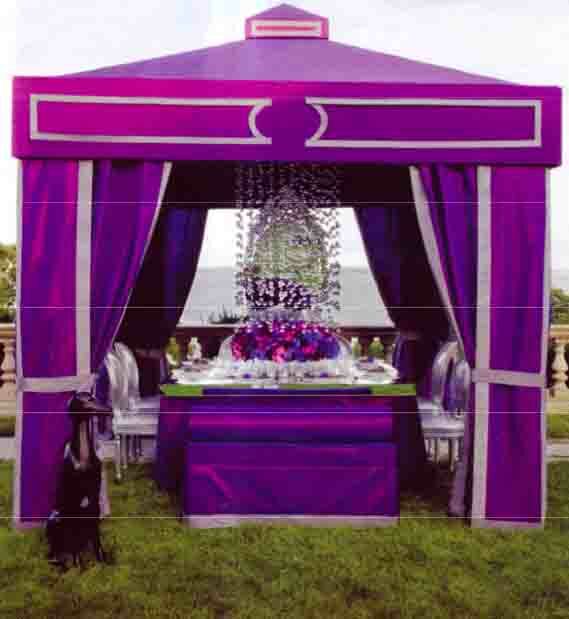 So I suggest dressing the table in quite a theatrical way so it has a fantasy-like quality to it. When I think of The Secret Garden it conjures up images of an untouched and slightly overgrown garden where nature has been left to do its own thing. So I recommend keeping everything quite earthy, rustic, and deliberately un-manicured. Use a neutral coloured table cloth like beige or stone with matching napkins, then add a dark brown table runner down the middle. 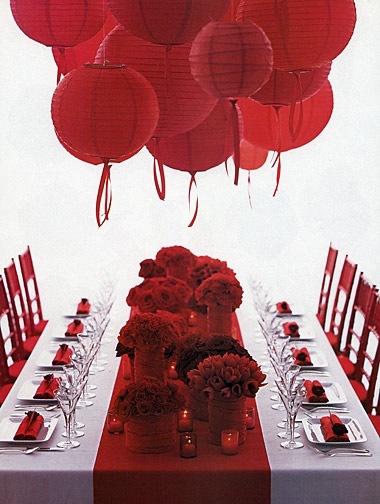 Red makes a great accent colour against earthy browns so set the table with dark red charger plates. 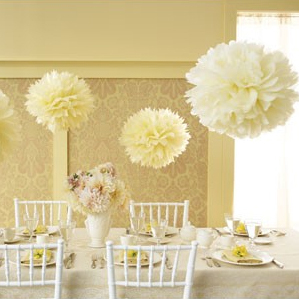 Wrap ivy tendrils around the table legs and up the backs of the chairs to create a wild, overgrown feel. 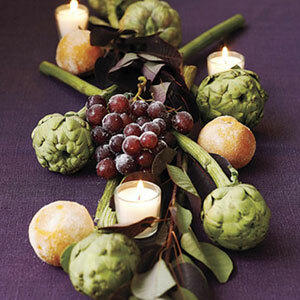 Keep a few tendrils spare to arrange over the top of the table after it’s been set. Intersperse a few white-pink rose heads in and among the ivy to soften the look and perhaps scatter a few leaves around. 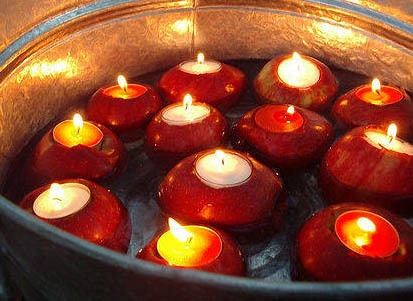 Carve out the top of red apples and pop in a small votive candle (see below) then dot these around the table to add more accents of red. 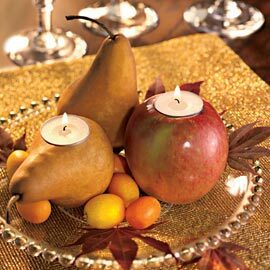 Alternatively, use a mixture of apples and pears. 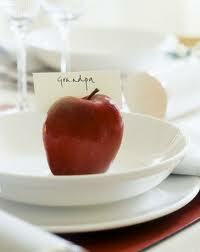 You can also use red apples as place card holders and position one on top of each napkin on the charger plate (below right). 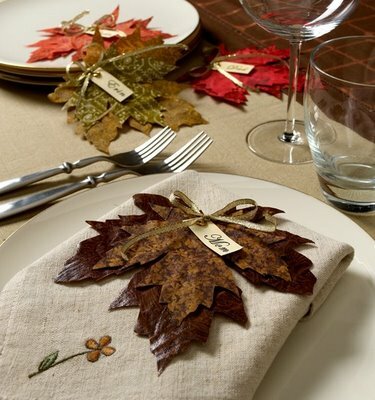 Alternatively you could make these beautiful leaf place cards (below, from Cathie Filian) using the stencil provided. 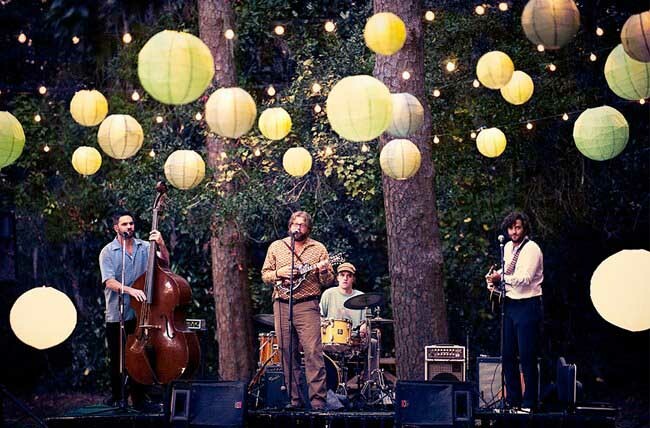 The photo here shows them in fall colors, but I think a mixture of green and brown would be perfect for these Secret Garden party decorations. Also, I'm sure you could make them using decorative paper instead of fabric if you prefer. 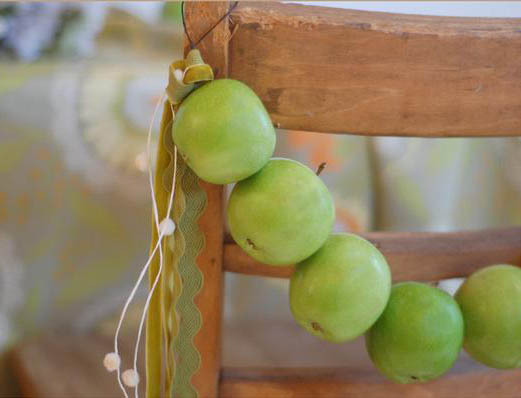 Following on with the apple theme, here's a tutorial for how to make these cute Apple Chair Swags (below, from The Bride's Cafe). 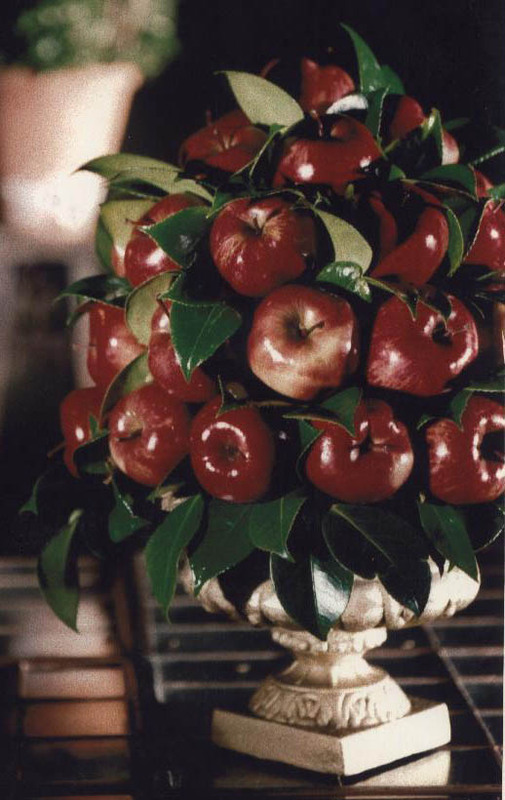 I'd suggest using red apples though, as red makes a nice accent color against all the earth browns and greens of the other garden party decorations. 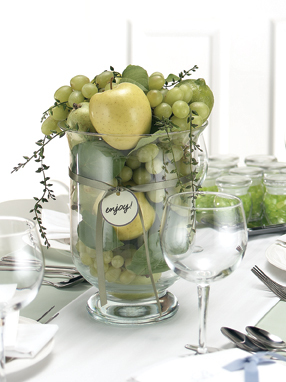 Centerpieces don't always have to be flowers. 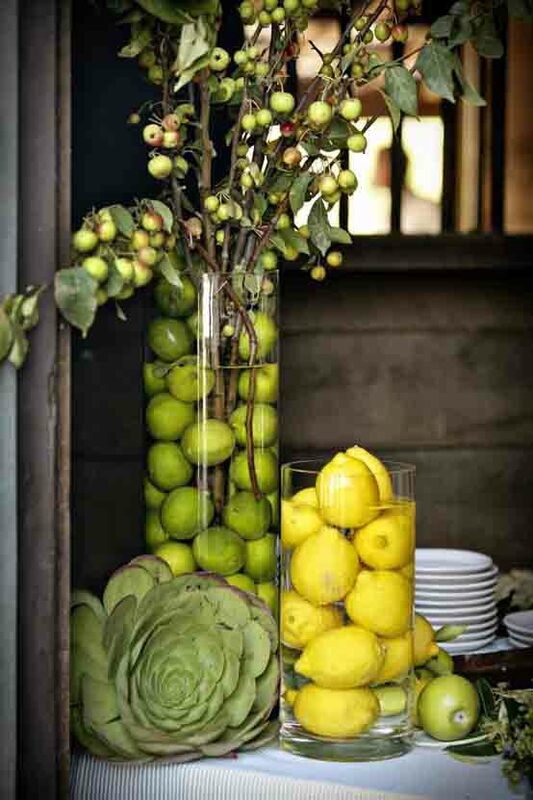 Instead, try arranging a pyramid of fruit mixed with some green leaves in a rustic wooden crate or urn and fasten them in place with floristry wire (see below left, created for one of my events by top UK florist Rob Van Helden). 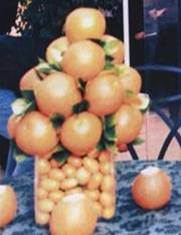 I prefer to use only one type of fruit in the arrangement (see another example, below center, from Your Wedding Day), but you can use a mixture if you want, especially if they are all similar colors (see below right, from Get Married). 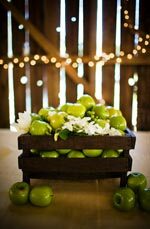 The same principle can also be applied to vegetables if you want to give your garden party decorations a really rustic feel. 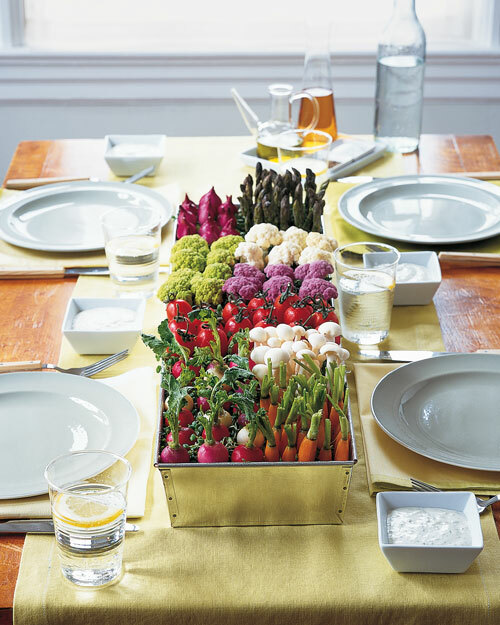 Check out this cute Crudite Centerpiece (below left, from Martha Stewart) or this Sugared Fruit and Vegetable Centerpiece (below right, from Delish). 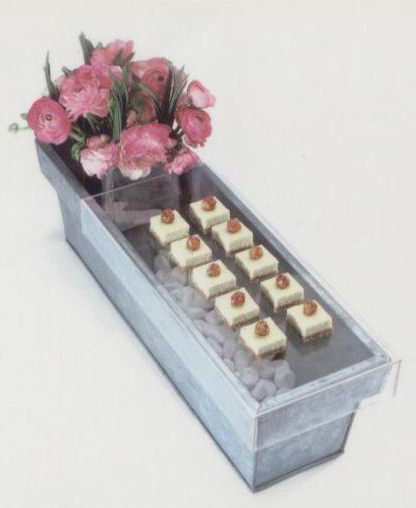 Check out my Secret Garden party page for food styling and presentation tips to go with these garden party decorations, such as this Veggie Buffet Table (below left) and Garden Planter Trays (below right). 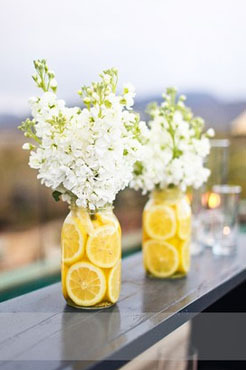 If you found these tips for garden party decorations useful, please take a minute to help me promote this page by clicking on the Facebook or Twitter buttons below. Alternatively, if you have your own site / blog or contribute to a relevant forum, click on 'Enjoy this page? Please pay it forward' to get the code to link directly to this page.